The government board overseeing the $3-billion Grand Avenue project on Monday unexpectedly rejected the developer's request for an eight-month delay to begin construction on the development across from the Walt Disney Concert Hall. While both sides said they remain optimistic that the sprawling downtown Los Angeles development is on track, the vote is the strongest sign yet that government officials are growing concerned over repeated delays and hope to keep a tight rein on the developer they handpicked for the project almost four years ago. 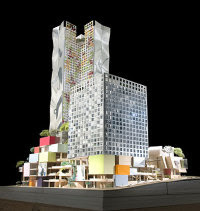 ...one county supervisor, Michael Antonovich, suggested that the Frank Gehry-designed project be scaled back because of real estate market conditions. "Given the stark economic climate," said Paul Novak, a planning deputy for Antonovich, "our best approach may be less of a 'grand' vision than the plan previously approved by the county and the city." Novak suggested that the joint powers authority should revisit various components of the project, including the high-end retail stores and the five-star hotel. Grand Avenue is the linchpin in the effort to revitalize downtown L.A. and to bring in more affluent residents and retailers. The development would rise around some of the city's landmark cultural institutions, including Disney Hall, the Museum of Contemporary Art and the Music Center. Related California President Bill Witte said after the meeting that his company would "just continue to work with the committee." The Grand Avenue project's first phase -- which includes a shopping center, hotel and two residential towers -- was once slated to be completed in 2009. But that date was shifted to 2011. Now, Related wants to push the opening to 2012. Witte has said the delay in beginning construction would allow Related to finalize thousands of pages of construction documents before work begins. Because nearly 70% of building costs for the project would be for concrete and steel, completion of those documents may allow the developer to avoid overruns later. Related has struggled to find the funding to get the project off the ground. The California Public Employees' Retirement System pulled out of Grand Avenue last year, saying it had too much investment in downtown. But a fund controlled by Dubai's royal family has invested $100 million in Grand Avenue, and Related is seeking an additional equity partner for the project. Grand Avenue is one of several major developments around the nation that have been delayed because of the credit crunch. In Seattle, developers recently shelved plans for a $7-billion development, citing the poor economy. Huge projects in Las Vegas, Phoenix and New York City have also been scaled back or delayed, including part of the Gehry-designed Atlantic Yards in Brooklyn and a $14-billion development of the area around Penn Station on Manhattan.